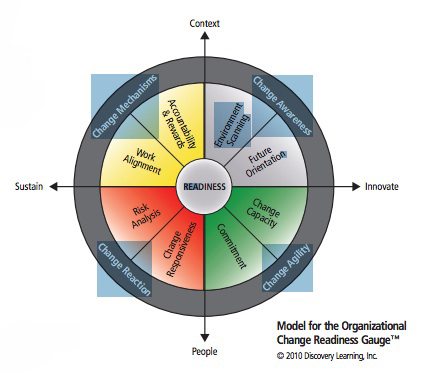 In Part 1 of this series, we offered a list of situations that could indicate your organization's need to address change readiness. Change awareness is the ability to proactively search for and see opportunities for renewal and innovation. An organization with good change awareness is skilled at scanning the environment for opportunities and emerging trends, planning for the future, and redefining itself as needed. Change agility is the capacity of leaders to facilitate and deliver change that’s needed. An organization with good change agility can communicate and engage commitment to achieve needed change in a timely manner, giving it the capacity to stretch, adapt skills, and shift resources when necessary. Change reaction represents the ability to analyze problems, assess risks, and manage the reactions of employees to react and respond appropriately and quickly to unplanned change (change that stems from market, economic, and technology changes rather than internal strategy and innovation). Change mechanisms are the structures and systems that support the implementation of change. This includes having clear goal alignment across functions, the ability to integrate a change into existing systems, accountability for results, and reward systems that reinforce desired change behaviors.